A Delta State University employee suspected in the fatal shooting of a professor at the Cleveland, Mississippi, campus is dead, police said, bringing a close to a day-long manhunt. Shannon Lamb, 45, was also identified by police as a suspect in the deadly shooting of a woman in a town some 300 miles away. A manhunt continued throughout the day, and ended late Monday. Cleveland Police Chief Charles Bingham, speaking at an overnight news conference, said officers followed the suspect's car -- and that Lamb pulled over on his own, exited his vehicle and ran into the woods. The officers heard one gunshot, Bingham said, and the suspect was found with one self-inflicted gunshot wound to the head. Earlier in the evening, police said they spoke to Lamb, who told them that he's "not going to jail," according to the Associated Press. It was not clear when or how investigators spoke to him, but they urged residents to use caution if they encounter him. The shooting was reported around 10:15 a.m. in Jobe Hall on campus and school was placed on lockdown, police said. The victim, identified as Ethan Schmidt, was found dead in his office. The school's Facebook page lists him as an assistant professor of history. No students were injured, police said. 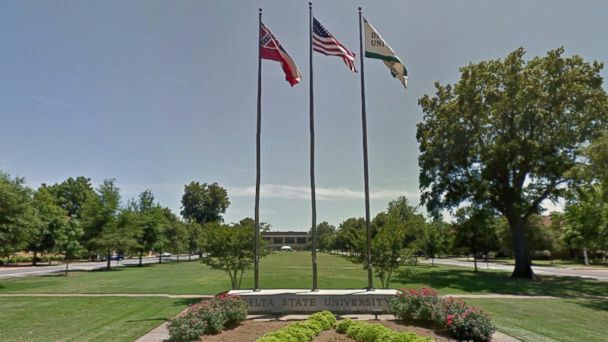 Classes at Delta State were canceled for Monday and Tuesday, and other schools in the area were also placed on lockdown. A candlelight vigil has also been scheduled for Tuesday on the campus. On the school's website, a man named Shannon Lamb is described as an Instructor of Geography and Social Science Education. Police in the town of Gautier, Mississippi, about 300 miles south of Cleveland, also told reporters that Lamb is a suspect in the deadly shooting of a woman, Amy Prentiss, at a home there. The police believe Lamb was living with the woman in Gautier, and left the house to travel to Delta State. Lamb's connection to Schmidt, if any, was not released by police. Schmidt specialized in Native American and colonial history, according to English professor Don Allan Mitchell, who called his colleague "a gentleman in every sense of the word."